1 Then I heard a loud voice from the temple saying to the seven angels, "Go and pour out the bowls of the wrath of God on the earth." 5 And I heard the angel of the waters saying: "You are righteous, O Lord, The One who is and who was and who is to be, Because You have judged these things. 6 For they have shed the blood of saints and prophets, And You have given them blood to drink. For it is their just due." 7 And I heard another from the altar saying, "Even so, Lord God Almighty, true and righteous are Your judgments." Revelation 15:6-8 - And out of the temple came the seven angels having the seven plagues, clothed in pure bright linen, and having their chests girded with golden bands. Then one of the four living creatures gave to the seven angels seven golden bowls full of the wrath of God who lives forever and ever. The temple was filled with smoke from the glory of God and from His power, and no one was able to enter the temple till the seven plagues of the seven angels were completed. The smoke from God's glory prevents anyone from entering the temple. So, the loud voice that John hears coming from the temple is presumably God's voice who directs the angels to pour out their bowls filled with the wrath of God. The living creatures announce the first four Seal judgments, but the last three Seal judgments have no formal proclamation (Revelation 6). Then the seven angels who stand before God receive seven trumpets, and as they blow them in turn they initiate all seven Trumpet judgments (Revelation 8:2). God directs all the judgments - Seals, Trumpets, and Bowls - but the Bowl judgments are different, in that God initiates them with His voice instead of using ministering spirits to proclaim the judgments, as He did in the Seal and Trumpet judgments. Recall from Revelation 8:13, an angel calls the last three Trumpet judgments "woes," because of the greater severity and broader scope compared to the previous judgments. 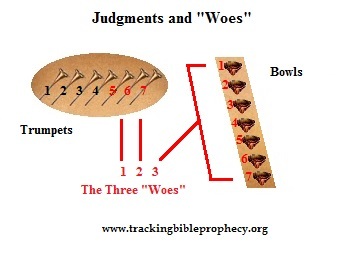 The last woe is the seventh Trumpet judgment and consists of all seven Bowl judgments. Some scholars suggest that the first four Trumpet judgments are a call to repentance because they are partial and extend to only a third of the earth. The time for repentance ends before the fifth, sixth, and seventh Trumpet judgments. With outpouring of the Bowl judgments as the seventh trumpet is sounded, God's judgment becomes unrestrained and extends to the entire globe. These last judgments are for vengeance and recompense (Isaiah 34). This notion has support in that the earth dwellers blaspheme God in response to His wrath and refuse to repent in the sixth Trumpet judgment and two of the Bowl judgments (Revelation 9:20-21, 16:9-11). It appears that the decisions for or against Christ are made by this point near the end of the Tribulation, and those who continue to reject the Lord are given over to a reprobate mind (Romans 1:28), or a hardened heart like Pharaoh (Exodus 10), and God's longsuffering turns to judgment when the iniquity of the people is complete (Genesis 15:16). Jeremiah 7:20, 10:25, 42:18, 44:6 - Therefore thus says the Lord GOD: "Behold, My anger and My fury will be poured out on this place - on man and on beast, on the trees of the field and on the fruit of the ground. And it will burn and not be quenched...." Pour out Your fury on the Gentiles, who do not know You, and on the families who do not call on Your name; for they have eaten up Jacob, devoured him and consumed him, and made his dwelling place desolate.... "For thus says the LORD of hosts, the God of Israel: 'As My anger and My fury have been poured out on the inhabitants of Jerusalem, so will My fury be poured out on you when you enter Egypt. And you shall be an oath, an astonishment, a curse, and a reproach; and you shall see this place no more....' So My fury and My anger were poured out and kindled in the cities of Judah and in the streets of Jerusalem; and they are wasted and desolate, as it is this day.'" Lamentations 4:11 - The LORD has fulfilled His fury, He has poured out His fierce anger. He kindled a fire in Zion, and it has devoured its foundations. Ezekiel 7:8; 20:8, 13, 21; 21:31; 22:22, 31; 36:18 - Now upon you I will soon pour out My fury, and spend My anger upon you; I will judge you according to your ways, and I will repay you for all your abominations.... But they rebelled against Me and would not obey Me. They did not all cast away the abominations which were before their eyes, nor did they forsake the idols of Egypt. Then I said, 'I will pour out My fury on them and fulfill My anger against them in the midst of the land of Egypt....' Yet the house of Israel rebelled against Me in the wilderness; they did not walk in My statutes; they despised My judgments, 'which, if a man does, he shall live by them'; and they greatly defiled My Sabbaths. Then I said I would pour out My fury on them in the wilderness, to consume them.... "Notwithstanding, the children rebelled against Me; they did not walk in My statutes, and were not careful to observe My judgments, 'which, if a man does, he shall live by them'; but they profaned My Sabbaths. Then I said I would pour out My fury on them and fulfill My anger against them in the wilderness.... I will pour out My indignation on you; I will blow against you with the fire of My wrath, and deliver you into the hands of brutal men who are skillful to destroy.... As silver is melted in the midst of a furnace, so shall you be melted in its midst; then you shall know that I, the LORD, have poured out My fury on you....' " Therefore I have poured out My indignation on them; I have consumed them with the fire of My wrath; and I have recompensed their deeds on their own heads," says the Lord GOD.... Therefore I poured out My fury on them for the blood they had shed on the land, and for their idols with which they had defiled it. Daniel 9:11 - Yes, all Israel has transgressed Your law, and has departed so as not to obey Your voice; therefore the curse and the oath written in the Law of Moses the servant of God have been poured out on us, because we have sinned against Him. Psalms 79:1-7 - O God, the nations have come into Your inheritance; Your holy temple they have defiled; they have laid Jerusalem in heaps. The dead bodies of Your servants they have given as food for the birds of the heavens, the flesh of Your saints to the beasts of the earth. Their blood they have shed like water all around Jerusalem, and there was no one to bury them. We have become a reproach to our neighbors, a scorn and derision to those who are around us. How long, LORD? Will You be angry forever? Will Your jealousy burn like fire? Pour out Your wrath on the nations that do not know You, and on the kingdoms that do not call on Your name. For they have devoured Jacob, and laid waste his dwelling place. Titus 3:3-6 - For we ourselves were also once foolish, disobedient, deceived, serving various lusts and pleasures, living in malice and envy, hateful and hating one another. But when the kindness and the love of God our Savior toward man appeared, not by works of righteousness which we have done, but according to His mercy He saved us, through the washing of regeneration and renewing of the Holy Spirit, whom He poured out on us abundantly through Jesus Christ our Savior, that having been justified by His grace we should become heirs according to the hope of eternal life. Joel 2:28-32 - "And it shall come to pass afterward that I will pour out My Spirit on all flesh; your sons and your daughters shall prophesy, your old men shall dream dreams, your young men shall see visions. And also on My menservants and on My maidservants I will pour out My Spirit in those days. "And I will show wonders in the heavens and in the earth: Blood and fire and pillars of smoke. The sun shall be turned into darkness, and the moon into blood, before the coming of the great and awesome day of the LORD. And it shall come to pass that whoever calls on the name of the LORD shall be saved. For in Mount Zion and in Jerusalem there shall be deliverance, as the LORD has said, among the remnant whom the LORD calls." Sea 2nd Trumpet - Third of the sea becomes blood, which kills a third of the sea creatures (Revelation 8:8-9). 2nd Bowl - All of the sea becomes blood, which kill all of the sea creatures (Revelation 16:3). (Revelation 8:10-11). 3rd Bowl - All the rivers and springs turn to blood (Revelation 16:4). Sun 4th Trumpet - The sun and luminaries darkened by a third (Revelation 8:12). 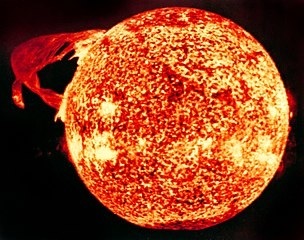 4th Bowl - The sun scorches men with fire (Revelation 16:8-9). Humans Tortured and Darkness 5th Trumpet - Men are tortured for five months by demonic locusts that come from the bottomless pit, from which smoke comes out and darkens the sun and the air (Revelation 9:1-11). 5th Bowl - Inhabitants of the beast's kingdom tortured by darkness that causes sores and pain (Revelation 16:10-11). and the Euphrates River 6th Trumpet - Fallen angels bound at the Euphrates River released to lead a demonic army of horses and horsemen to kill a third of the humans on Earth (Revelation 9:13-21). 6th Bowl - Euphrates River dries up and demonic frogs gather the kingdoms of the world to battle Christ in Armageddon (Revelation 16:12-16). Earthquake and Hail on the Nations 7th Trumpet - Heaven proclaims the Lord is about to return to begin His Kingdom and put an end to the kingdoms on Earth. God responds with lightnings, noises, thundering, an earthquake, and great hail (Revelation 11:15-19). 7th Bowl - God announces "It is done!" followed by noises, thundering, a great earthquake that destroys the cities of the nations, and exceedingly great hail (Revelation 16:17-21). Nile turned to blood (Exodus 7:14-25) Sea, rivers, and streams turn to blood. the world to battle Christ in Armageddon. often as they desire (Revelation 11:6). and the inhabitants of his kingdoms. Hail (Exodus 9:14-35) Hail on the earth and the nations. Locusts (Exodus 10:1-20) Men tortured by demonic locusts. Darkness (Exodus 10:21-29) Darkness on the beast's kingdom. These plagues will not be limited regionally this time such as when God judged Egypt - they will serve to judge the whole earth. Revelation 16:2 - So the first went and poured out his bowl upon the earth, and a foul and loathsome sore came upon the men who had the mark of the beast and those who worshiped his image. Job 2:4-7 - So Satan answered the LORD and said, "Skin for skin! Yes, all that a man has he will give for his life. But stretch out Your hand now, and touch his bone and his flesh, and he will surely curse You to Your face!" And the LORD said to Satan, "Behold, he is in your hand, but spare his life." So Satan went out from the presence of the Lord, and struck Job with painful boils from the sole of his foot to the crown of his head. Exodus 9:8-12 - So the LORD said to Moses and Aaron, "Take for yourselves handfuls of ashes from a furnace, and let Moses scatter it toward the heavens in the sight of Pharaoh. And it will become fine dust in all the land of Egypt, and it will cause boils that break out in sores on man and beast throughout all the land of Egypt." Then they took ashes from the furnace and stood before Pharaoh, and Moses scattered them toward heaven. And they caused boils that break out in sores on man and beast. And the magicians could not stand before Moses because of the boils, for the boils were on the magicians and on all the Egyptians. But the LORD hardened the heart of Pharaoh; and he did not heed them, just as the LORD had spoken to Moses. Deuteronomy 28:15, 27, 35, 58-60 - "But it shall come to pass, if you do not obey the voice of the LORD your God, to observe carefully all His commandments and His statutes which I command you today, that all these curses will come upon you and overtake you.... The LORD will strike you with the boils of Egypt, with tumors, with the scab, and with the itch, from which you cannot be healed.... The LORD will strike you in the knees and on the legs with severe boils which cannot be healed, and from the sole of your foot to the top of your head.... If you do not carefully observe all the words of this law that are written in this book, that you may fear this glorious and awesome name, THE LORD YOUR GOD, then the LORD will bring upon you and your descendants extraordinary plagues - great and prolonged plagues - and serious and prolonged sicknesses. Moreover He will bring back on you all the diseases of Egypt, of which you were afraid, and they shall cling to you." Revelation 14:9-11 - Then a third angel followed them, saying with a loud voice, "If anyone worships the beast and his image, and receives his mark on his forehead or on his hand, he himself shall also drink of the wine of the wrath of God, which is poured out full strength into the cup of His indignation. He shall be tormented with fire and brimstone in the presence of the holy angels and in the presence of the Lamb. And the smoke of their torment ascends forever and ever; and they have no rest day or night, who worship the beast and his image, and whoever receives the mark of his name." Some speculate that the material used to make the "mark of the beast" causes the sores. The mark gets implemented sometime in the middle of the Tribulation over the course of the next 3 ½ years, and not everyone will get the mark at the same time. However, the boils come on the beast worshippers at the same time when the angel pours out the first Bowl judgment at the end of the Tribulation. So, it doesn't make sense that the material used to make the "mark of the beast" causes the boil on each beast worshipper, otherwise people would get boils at various times in the second half of the Tribulation. The fact the beast worshippers all get the plague of boils at the same time suggests this is a supernatural judgment poured out by God's angel at an appointed time near the end of the Tribulation. Revelation 16:3 - Then the second angel poured out his bowl on the sea, and it became blood as of a dead man; and every living creature in the sea died. The next two Bowl judgments turn all of the earth's bodies of water to blood like the first plague on Egypt where Moses turned the Nile River to blood (Exodus 7:14-25), and like the second Trumpet judgment where a third of the sea becomes blood (Revelation 8:8-9). As discussed in Revelation 6:13, the Greek word for "blood" is "haima," which is where we derive our words like "hemoglobin" in human blood. Blood consists of iron, and "hematite," which describes the blood-red color of iron oxide (Source). Iron oxide can cause water to look like blood (Sources: 1 2 3). Iron oxide in dust particles are known to form blood rain (Source). Iron oxide is also found in comets (Sources: 1 2 3 4). Therefore, comet fragments entering the atmosphere could look like hail and fire, mingled with blood (Revelation 8:7), and a sizable fragment could make a large body of water become like blood (Revelation 8:8). Hosea 4:1-3 - Hear the word of the LORD, you children of Israel, for the LORD brings a charge against the inhabitants of the land: "There is no truth or mercy or knowledge of God in the land. By swearing and lying, killing and stealing and committing adultery, they break all restraint, with bloodshed upon bloodshed. Therefore the land will mourn; and everyone who dwells there will waste away with the beasts of the field and the birds of the air; even the fish of the sea will be taken away." Zephaniah 1:2-7 - "I will utterly consume everything from the face of the land," Says the LORD; "I will consume man and beast; I will consume the birds of the heavens, the fish of the sea, and the stumbling blocks along with the wicked. I will cut off man from the face of the land," Says the LORD. "I will stretch out My hand against Judah, and against all the inhabitants of Jerusalem. I will cut off every trace of Baal from this place, the names of the idolatrous priests with the pagan priests - those who worship the host of heaven on the housetops; those who worship and swear oaths by the LORD, but who also swear by Milcom; those who have turned back from following the LORD, and have not sought the LORD, nor inquired of Him." Be silent in the presence of the Lord GOD; for the day of the LORD is at hand, for the LORD has prepared a sacrifice; He has invited His guests." Revelation 16:4 - Then the third angel poured out his bowl on the rivers and springs of water, and they became blood. Revelation 8:10-11 - Then the third angel sounded: And a great star fell from heaven, burning like a torch, and it fell on a third of the rivers and on the springs of water. The name of the star is Wormwood. A third of the waters became wormwood, and many men died from the water, because it was made bitter. But in the third Bowl judgment, all the rivers and springs are completely corrupted and turned to blood. The water, which is a symbol of the Holy Spirt and life (Isaiah 55:1, John 4:14, John 7:37-39, 1 Corinthians 12:13) literally turns into corruption and death. The fact that the second and third Bowl judgments contaminate all the earth's water sources show that the angels pour them out at the very end of the Tribulation, because no one on the earth could survive without fresh water for more than a few days. Revelation 16:5-7 - And I heard the angel of the waters saying: "You are righteous, O Lord, the One who is and who was and who is to be, because You have judged these things. For they have shed the blood of saints and prophets, and You have given them blood to drink. For it is their just due." And I heard another from the altar saying, "Even so, Lord God Almighty, true and righteous are Your judgments." John calls the angel who turned the rivers and springs of water to blood in the third Bowl judgment the "angel of the waters." In Revelation 14:18, we saw an angel who had power over fire, and Daniel 10:20-21 shows that other angels have responsibilities over different geographical areas. In addition to delegating judgments to angels, God also entrusts angels with the care and administration over different parts of His creation. Revelation 6:9-11 - When He opened the fifth seal, I saw under the altar the souls of those who had been slain for the word of God and for the testimony which they held. And they cried with a loud voice, saying, "How long, O Lord, holy and true, until You judge and avenge our blood on those who dwell on the earth?" Then a white robe was given to each of them; and it was said to them that they should rest a little while longer, until both the number of their fellow servants and their brethren, who would be killed as they were, was completed. Revelation 19:1-3 - After these things I heard a loud voice of a great multitude in heaven, saying, "Alleluia! Salvation and glory and honor and power belong to the Lord our God! For true and righteous are His judgments, because He has judged the great harlot who corrupted the earth with her fornication; and He has avenged on her the blood of His servants shed by her." Again they said, "Alleluia! Her smoke rises up forever and ever!" Revelation 18:10, 20 - ...Alas, alas, that great city Babylon, that mighty city! For in one hour your judgment has come.... "Rejoice over her, O heaven, and you holy apostles and prophets, for God has avenged you on her!" Isaiah 59:17-18 - For He put on righteousness as a breastplate, and a helmet of salvation on His head; He put on the garments of vengeance for clothing, and was clad with zeal as a cloak. According to their deeds, accordingly He will repay, fury to His adversaries, recompense to His enemies; the coastlands He will fully repay. Psalms 28:4-5 - Give them according to their deeds, and according to the wickedness of their endeavors; give them according to the work of their hands; render to them what they deserve. Because they do not regard the works of the LORD, nor the operation of His hands, He shall destroy them and not build them up. Romans 2:5-11 - But in accordance with your hardness and your impenitent heart you are treasuring up for yourself wrath in the day of wrath and revelation of the righteous judgment of God, who "will render to each one according to his deeds ": eternal life to those who by patient continuance in doing good seek for glory, honor, and immortality; but to those who are self-seeking and do not obey the truth, but obey unrighteousness - indignation and wrath, tribulation and anguish, on every soul of man who does evil, of the Jew first and also of the Greek; but glory, honor, and peace to everyone who works what is good, to the Jew first and also to the Greek. For there is no partiality with God. 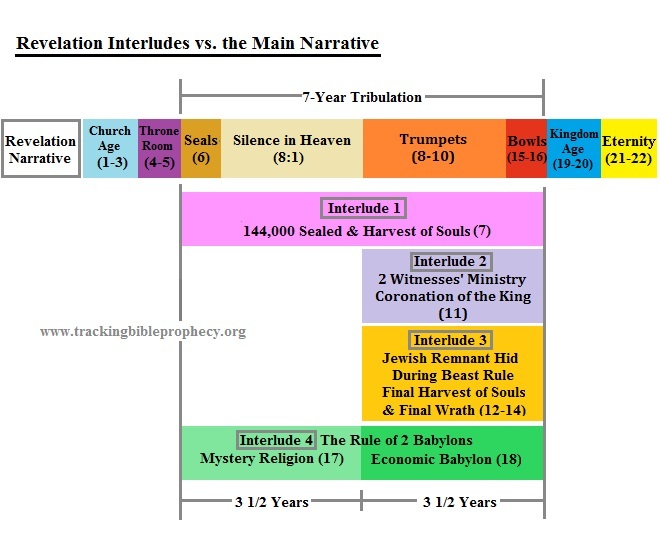 Revelation 1:4-6 - John, to the seven churches which are in Asia: Grace to you and peace from Him who is and who was and who is to come, and from the seven Spirits who are before His throne, and from Jesus Christ, the faithful witness, the firstborn from the dead, and the ruler over the kings of the earth. To Him who loved us and washed us from our sins in His own blood, and has made us kings and priests to His God and Father, to Him be glory and dominion forever and ever. Amen. Revelation 1:8 - "I am the Alpha and the Omega, the Beginning and the End," says the Lord, "who is and who was and who is to come, the Almighty." Revelation 4:8 - The four living creatures, each having six wings, were full of eyes around and within. And they do not rest day or night, saying: "Holy, holy, holy, Lord God Almighty, who was and is and is to come!" Revelation 11:16-17 - And the twenty-four elders who sat before God on their thrones fell on their faces and worshiped God, saying: "We give You thanks, O Lord God Almighty, the One who is and who was and who is to come, because You have taken Your great power and reigned." Recall from Revelation 1:4, the title: "Who is and who was and who is to come" describes the eternal nature of the Lord (Micah 5:2, Isaiah 9:6, John 17:24). The Old Testament version of this eternal title for God is "from everlasting to everlasting" (1 Chronicles 16:36, Psalms 41:13, 90:2, 103:17, 106:48). Another angel praises the Lord from the altar. Perhaps this is the angel who offered the prayers of the saints from the golden altar (Revelation 8:3-5), and the same angel with power over fire that came out from the altar (Revelation 14:18). Like the "angel of the waters," the angel from the altar also praises the Lord for His judgments and calls Him "Lord God Almighty." As discussed in Revelation 1:8, the Greek word translated "Almighty" can mean ruler of all, the one who holds all, the one exercising absolute dominion with unrestricted power, or "omnipotent," as translated in Revelation 19:6. In short, the title "Almighty" shows God's sovereignty. Psalms 119:137 - Righteous are You, O LORD, and upright are Your judgments. Romans 12:19 - Beloved, do not avenge yourselves, but rather give place to wrath; for it is written, "Vengeance is Mine, I will repay," says the Lord. Hebrews 10:30-31 - For we know Him who said, "Vengeance is Mine, I will repay," says the Lord. And again, "The Lord will judge His people." It is a fearful thing to fall into the hands of the living God. Psalms 9:7-12 - But the LORD shall endure forever; He has prepared His throne for judgment. He shall judge the world in righteousness, and He shall administer judgment for the peoples in uprightness. The LORD also will be a refuge for the oppressed, a refuge in times of trouble. And those who know Your name will put their trust in You; for You, LORD, have not forsaken those who seek You. Sing praises to the LORD, who dwells in Zion! Declare His deeds among the people. When He avenges blood, He remembers them; He does not forget the cry of the humble. Revelation 19:2 - For true and righteous are His judgments, because He has judged the great harlot who corrupted the earth with her fornication; and He has avenged on her the blood of His servants shed by her." Jeremiah 4:1-2 - "If you will return, O Israel," says the LORD, "Return to Me; and if you will put away your abominations out of My sight, then you shall not be moved. And you shall swear, 'The LORD lives,' In truth, in judgment, and in righteousness; the nations shall bless themselves in Him, and in Him they shall glory." Revelation 16:8-9 - Then the fourth angel poured out his bowl on the sun, and power was given to him to scorch men with fire. And men were scorched with great heat, and they blasphemed the name of God who has power over these plagues; and they did not repent and give Him glory. Luke 16:19-24 - "There was a certain rich man who was clothed in purple and fine linen and fared sumptuously every day. But there was a certain beggar named Lazarus, full of sores, who was laid at his gate, desiring to be fed with the crumbs which fell from the rich man's table. Moreover the dogs came and licked his sores. So it was that the beggar died, and was carried by the angels to Abraham's bosom. The rich man also died and was buried. And being in torments in Hades, he lifted up his eyes and saw Abraham afar off, and Lazarus in his bosom. "Then he cried and said, 'Father Abraham, have mercy on me, and send Lazarus that he may dip the tip of his finger in water and cool my tongue; for I am tormented in this flame.'" Revelation 7:16-17 - "They shall neither hunger anymore nor thirst anymore; the sun shall not strike them, nor any heat for the Lamb who is in the midst of the throne will shepherd them and lead them to living fountains of waters. And God will wipe away every tear from their eyes." But like Lazarus, the Tribulation saints will find relief from their torment on the earth after they die, and the Lord will comfort them in Heaven. However, on the earth, any hope for fresh water sources will quickly fade as snowpacks and glaciers will surely melt from the blast of the sun in the fourth Bowl judgment and flood the coastal regions with the contaminated bloody water from the second and third Bowl judgments. This "global warming" from the sun will create unimaginable catastrophes, and make today's supposed "climate change" caused by humans look foolish. Isaiah 13:10-13 - For the stars of heaven and their constellations will not give their light; the sun will be darkened in its going forth, and the moon will not cause its light to shine. "I will punish the world for its evil, and the wicked for their iniquity; I will halt the arrogance of the proud, and will lay low the haughtiness of the terrible. I will make a mortal more rare than fine gold, a man more than the golden wedge of Ophir. Therefore I will shake the heavens, and the earth will move out of her place, in the wrath of the LORD of hosts and in the day of His fierce anger." Matthew 24:29 - "Immediately after the tribulation of those days the sun will be darkened, and the moon will not give its light; the stars will fall from heaven, and the powers of the heavens will be shaken." Mark 13:24 - "But in those days, after that tribulation, the sun will be darkened, and the moon will not give its light...."
Joel 3:14-15 - Multitudes, multitudes in the valley of decision! For the day of the LORD is near in the valley of decision. The sun and moon will grow dark, and the stars will diminish their brightness. Isaiah 24:1, 4-6 - Behold, the LORD makes the earth empty and makes it waste, distorts its surface and scatters abroad its inhabitants.... The earth mourns and fades away, the world languishes and fades away; the haughty people of the earth languish. The earth is also defiled under its inhabitants, because they have transgressed the laws, changed the ordinance, broken the everlasting covenant. Therefore the curse has devoured the earth, and those who dwell in it are desolate. Therefore the inhabitants of the earth are burned, and few men are left. Revelation 13:4-6 - So they worshiped the dragon who gave authority to the beast; and they worshiped the beast, saying, "Who is like the beast? Who is able to make war with him?" And he was given a mouth speaking great things and blasphemies, and he was given authority to continue for forty-two months. Then he opened his mouth in blasphemy against God, to blaspheme His name, His tabernacle, and those who dwell in heaven. Malachi 4:1-3 - "For behold, the day is coming, burning like an oven, and all the proud, yes, all who do wickedly will be stubble. And the day which is coming shall burn them up," says the LORD of hosts, "That will leave them neither root nor branch. But to you who fear My name The Sun of Righteousness shall arise with healing in His wings; and you shall go out and grow fat like stall-fed calves. You shall trample the wicked, for they shall be ashes under the soles of your feet on the day that I do this," says the LORD of hosts." Revelation 2:20-22 - Nevertheless I have a few things against you, because you allow that woman Jezebel, who calls herself a prophetess, to teach and seduce My servants to commit sexual immorality and eat things sacrificed to idols. And I gave her time to repent of her sexual immorality, and she did not repent. Indeed I will cast her into a sickbed, and those who commit adultery with her into great tribulation, unless they repent of their deeds. Proverbs 27:22 - Though you grind a fool in a mortar with a pestle along with crushed grain, yet his foolishness will not depart from him. Romans 1:22-27 - Professing to be wise, they became fools, and changed the glory of the incorruptible God into an image made like corruptible man - and birds and four-footed animals and creeping things. Therefore God also gave them up to uncleanness, in the lusts of their hearts, to dishonor their bodies among themselves, who exchanged the truth of God for the lie, and worshiped and served the creature rather than the Creator, who is blessed forever. Amen. For this reason God gave them up to vile passions. For even their women exchanged the natural use for what is against nature. Likewise also the men, leaving the natural use of the woman, burned in their lust for one another, men with men committing what is shameful, and receiving in themselves the penalty of their error which was due. Romans 1:28-32 - And even as they did not like to retain God in their knowledge, God gave them over to a debased mind, to do those things which are not fitting; being filled with all unrighteousness, sexual immorality, wickedness, covetousness, maliciousness; full of envy, murder, strife, deceit, evil-mindedness; they are whisperers, backbiters, haters of God, violent, proud, boasters, inventors of evil things, disobedient to parents, undiscerning, untrustworthy, unloving, unforgiving, unmerciful; who, knowing the righteous judgment of God, that those who practice such things are deserving of death, not only do the same but also approve of those who practice them. Titus 3:3-7 - For we ourselves were also once foolish, disobedient, deceived, serving various lusts and pleasures, living in malice and envy, hateful and hating one another. But when the kindness and the love of God our Savior toward man appeared, not by works of righteousness which we have done, but according to His mercy He saved us, through the washing of regeneration and renewing of the Holy Spirit, whom He poured out on us abundantly through Jesus Christ our Savior, that having been justified by His grace we should become heirs according to the hope of eternal life. Daniel 12:10 - Many shall be purified, made white, and refined, but the wicked shall do wickedly; and none of the wicked shall understand, but the wise shall understand. Revelation 22:11 - "He who is unjust, let him be unjust still; he who is filthy, let him be filthy still; he who is righteous, let him be righteous still; he who is holy, let him be holy still." Psalms 96:8-13 - Give to the LORD the glory due His name; bring an offering, and come into His courts. Oh, worship the LORD in the beauty of holiness! Tremble before Him, all the earth. Say among the nations, "The LORD reigns; the world also is firmly established, it shall not be moved; He shall judge the peoples righteously." Let the heavens rejoice, and let the earth be glad; let the sea roar, and all its fullness; let the field be joyful, and all that is in it. Then all the trees of the woods will rejoice before the LORD. For He is coming, for He is coming to judge the earth. He shall judge the world with righteousness, and the peoples with His truth. Revelation 4:9-11 - Whenever the living creatures give glory and honor and thanks to Him who sits on the throne, who lives forever and ever, the twenty-four elders fall down before Him who sits on the throne and worship Him who lives forever and ever, and cast their crowns before the throne, saying: "You are worthy, O Lord, to receive glory and honor and power; for You created all things, and by Your will they exist and were created." Revelation 14:7 - ...saying with a loud voice, "Fear God and give glory to Him, for the hour of His judgment has come; and worship Him who made heaven and earth, the sea and springs of water." 1 Peter 4:12-14 - Beloved, do not think it strange concerning the fiery trial which is to try you, as though some strange thing happened to you; but rejoice to the extent that you partake of Christ's sufferings, that when His glory is revealed, you may also be glad with exceeding joy. If you are reproached for the name of Christ, blessed are you, for the Spirit of glory and of God rests upon you. On their part He is blasphemed, but on your part He is glorified. Jeremiah 13:15-16 - Hear and give ear: Do not be proud, for the LORD has spoken. Give glory to the LORD your God before He causes darkness, and before your feet stumble on the dark mountains, and while you are looking for light, He turns it into the shadow of death and makes it dense darkness. While the darkness that overcame Judah was spiritual, as we will see in the next section that a spiritual and literal darkness will engulf the kingdom of the beast in response to his followers refusing to give glory to God, even though they recognize He is the one behind their misery. Revelation 16:10-11 - Then the fifth angel poured out his bowl on the throne of the beast, and his kingdom became full of darkness; and they gnawed their tongues because of the pain. They blasphemed the God of heaven because of their pains and their sores, and did not repent of their deeds. The fifth Bowl judgment plunges the throne and kingdom of the beast into darkness. It is not known how far the beast's kingdom extends, and if this includes most of the world or just the center of his kingdom in Babylon. The cause of the darkness isn't stated, but if it is from the sun and luminaries going dark then it would cover the world. However, other Scripture says that the sun and luminaries go dark "after" the Tribulation is over (Isaiah 13:10-13, Joel 3:14-15, Matthew 24:29, Mark 13:24) and it is not over until after all of God's judgments are complete, as discussed in the last section. Exodus 10:21-23 - Then the LORD said to Moses, "Stretch out your hand toward heaven, that there may be darkness over the land of Egypt, darkness which may even be felt." So Moses stretched out his hand toward heaven, and there was thick darkness in all the land of Egypt three days. They did not see one another; nor did anyone rise from his place for three days. But all the children of Israel had light in their dwellings. Note that this darkness only covered the dwelling places of the Egyptians and they could feel it. The inhabitants of the beast kingdom also feel pain in the darkness, which supports the idea that it is the same kind of darkness that covered Egypt. This darkness could come from an extreme dust storm, which can engulf an entire area into pitch blackness (Video 1, 2, 3). And the water sources contaminated with blood may compound the problem because electricity is dependent on water (Source). So, there likely wouldn't be much in the way of artificial light available either. Acts 13:9-11 - Acts 13:6-11 - Now when they had gone through the island to Paphos, they found a certain sorcerer, a false prophet, a Jew whose name was Bar-Jesus, who was with the proconsul, Sergius Paulus, an intelligent man. This man called for Barnabas and Saul and sought to hear the word of God. But Elymas the sorcerer (for so his name is translated) withstood them, seeking to turn the proconsul away from the faith. Then Saul, who also is called Paul, filled with the Holy Spirit, looked intently at him and said, "O full of all deceit and all fraud, you son of the devil, you enemy of all righteousness, will you not cease perverting the straight ways of the Lord? And now, indeed, the hand of the Lord is upon you, and you shall be blind, not seeing the sun for a time." And immediately a dark mist fell on him, and he went around seeking someone to lead him by the hand. "Some see this as a symbolic darkness. Caird called the last three plagues a "triad of political disaster" - internal anarchy, invasion, and irreparable collapse. But it isn't necessary to see this darkness as a symbolic political darkness. The ninth plague on Egypt was a literal darkness, with spiritual overtones. It could be felt, as described in Exodus 10:21-22." Matthew 8:12 - "But the sons of the kingdom will be cast out into outer darkness. There will be weeping and gnashing of teeth." The pain of those tormented will cause them to weep and gnash their teeth. The Greek word translated "gnashing" denotes "extreme anguish and utter despair of men consigned to eternal condemnation" (Source). Similarly, the pain from the darkness and the sores on those who dwell in the beast's kingdom make them gnaw their tongues because they are in a state of anguish and despair. Jeremiah 5:3-4 - O LORD, are not Your eyes on the truth? You have stricken them, but they have not grieved; You have consumed them, but they have refused to receive correction. They have made their faces harder than rock; they have refused to return. Therefore I said, "Surely these are poor. They are foolish; for they do not know the way of the LORD, the judgment of their God." Isaiah 26:9-10 - With my soul I have desired You in the night, yes, by my spirit within me I will seek You early; for when Your judgments are in the earth, the inhabitants of the world will learn righteousness. Let grace be shown to the wicked, yet he will not learn righteousness; in the land of uprightness he will deal unjustly, and will not behold the majesty of the LORD. "When wicked men are confronted with the power of God, they do not easily come to the place of repentance, but instead enlarge their rebellion against God." Amos 4:9-12 - "I blasted you with blight and mildew. When your gardens increased, your vineyards, your fig trees, and your olive trees, the locust devoured them; yet you have not returned to Me," Says the LORD. "I sent among you a plague after the manner of Egypt; your young men I killed with a sword, along with your captive horses; I made the stench of your camps come up into your nostrils; yet you have not returned to Me," Says the LORD. "I overthrew some of you, as God overthrew Sodom and Gomorrah, and you were like a firebrand plucked from the burning; yet you have not returned to Me," Says the LORD. "Therefore thus will I do to you, O Israel; because I will do this to you, prepare to meet your God, O Israel!" Daniel 2:44 - And in the days of these kings the God of heaven will set up a kingdom which shall never be destroyed; and the kingdom shall not be left to other people; it shall break in pieces and consume all these kingdoms, and it shall stand forever.